For a philosophy that is empirical and not simply empiricist, investigation offers the only way to ferret out its concepts and then put them to the test before proposing a version that can be submitted to critique by its peers. And yet, even though investigation as a genre benefits from a distinguished and intimidating prestige in philosophy, it is fairly unusual for an author to propose to carry out an investigation with the participation of his readers. This is nevertheless what I propose to do in publishing a book titled An Inquiry into Modes of Existence: An Anthropology of the Moderns, alongside a digital site that allows its visitors, who will have become co-investigators, to inspect its arguments and go on to suggest other fields to study, other proofs, other accounts. By means of this arrangement I invite my co-investigators to help me find the guiding thread of the experience by becoming attentive to several regimes of truth, which I call modes of existence, after the strange book by Étienne Souriau, recently republished, that features this phrase in its title. More here. H/t AIME. The video is definitely worth watching: it provides a succinct and clear summary of what otherwise sounds like a rather complex project. Why is it so difficult to be a materialist? Posted in art, Bruno Latour, philosophy, Social theory, STS, Video recordings | Comments Off on Why is it so difficult to be a materialist? Sign the petition and join the Facebook group to protest against the closure of the Middlesex philosophy department. 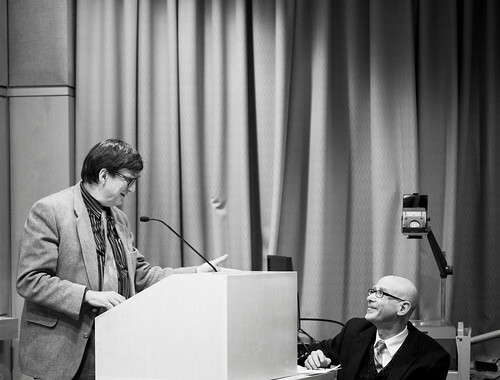 The video recording of the “Networks and Spheres: Two Ways to Reinterpret Globalization” talk with Bruno Latour and Peter Sloterdijk at Harvard University on 17 February 2009 is available here (thanks to Archinet). You are currently browsing the archives for the Video recordings category.